486 were produced by Nakajima as the L2D "Tabby"
No combat aircraft, the C-47 was nonetheless a vital contributor to Allied victory in the war. 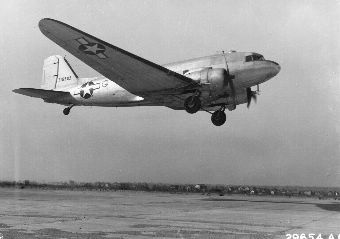 It was the military version of the DC-3, capable of carrying 28 troops, or more in an emergency. It was used by virtually every combatant nation in the Pacific, including the Japanese, who had begun producing the DC-3 under a 1938 license before war broke out. However, the Japanese never seemed to recognize the full potential of military air transport. It was known in British service as the Dakota and was manufactured by the Russians as the Li-2. The U.S. Navy designated it the R4D. The DC-3 was the third in a successful design family and the prototype first flew on 17 December 1935. It was originally designed for American Airlines, but many other airlines placed orders, and about 500 had been produced by the time war broke out in the Pacific. Production was promptly militarized and peaked at 4878 airframes in 1944. The military version featured a reinforced floor and large cargo door. Civilian DC-3s pressed into military service carried a bewildering array of designations: C-48, C-49, C-50, C-51, C-52, C-68, and C-8. Those which retained their airliner interior for the benefit of high-ranking staff were designated C-117. Postwar, the DC-3 formed the backbone of the world's civilian air transport industry, and some are still flying today. About a third of all American C-47 aircrew were deployed against Japan.